Join us for a very short casual cruise to visit one of Chicagolands oldest and most famous hot dog stands, Superdawg!! When: Friday April 18th, 7pm is the drivers meeting and then departure. Why: For a fun time hanging out with MINI friends, and good eats. What to bring: A camera, optional FRS radio tuned to Channel 1 subchannel 1 to help with navigation, your favorite MINI clothes, your appetite, and a smile. Dress for hanging around outside. NOTE: The Superdawg parking area is very small, so we will hang out across the street at the Walgreens parking lot when we are done, or if there is not enough space for everyone to fit at once. I’ll be there with the whole family!! My wife and I will be there!!! Lori and I are in! I was just there last Tuesday and man, it’s worth the $$ for a great dawg. FYI: Perhaps, as a courtesy if it becomes a large crowd is to call and let them know we’re coming. Paul, I have already called and worked out the details… no reserved spaces, but they know we’re coming. No ketchup on my dawg…thats blasphemy! Arnie, thanks for letting me know. Hopefully the snow will be gone by then. As a Pittsburgh native, I grew up south of the Heinz plant, I do not understand this aversion to Ketchup. Nectar of the Gods!!! JB, Ketchup on French Fries= yummm. However, I must agree w/ Marco. No Chicago Dawg should be subjected to such cruelty. It’s just wrong. Darn, I already made plans for the 18th! 🙁 I have wanted to do a MINI event at Superdawg for a while. Hope you guys have fun. Sounds good ! Maybe it will stop snowing by then ! Arnie, being my local expert, I will accept that, however, just so you know, a proper sandwich should have the fries on top, not on the side. Google Primanti Brothers if you have any questions! I’m so excited for the Superdawg event! My first CMMC event! See you there! Looking forward to meeting you there. What are you driving? I’m driving a dark sliver MCS ’07 with black bonnet stripes with head lamps. I cannot resist the Superdawg. I shall be there! I will try to make this, but Racine to Mundelein to Niles by 7 on a Friday will a chore. I should have the Clubman by then so could be the maiden CMMC event for it. My Husband and I will be there, it will be our first outing with the club. I sure hope my Mini gets here by then! Yes, my wife and I will be there. Superdawgs, I have heard of it but have never been there. I have been wanting to go for awhile, especially since hot dogs are one of my favorite foods. I would love to join the group!!! I hate to admit it, but I’ve lived in Chicago 27 years and have never been to SuperDawg! I realize it is an important Chicago icon. So, count me in! Sounds like more hot digs after the Cubs game. Is that good for a growing boy?? Count me and my wife in! My boyfriend and I will be there. This will be my first event…can’t wait to meet everyone! I’m not a club member, but live very close to where you want to meet. I was wondering if I can come anyway. 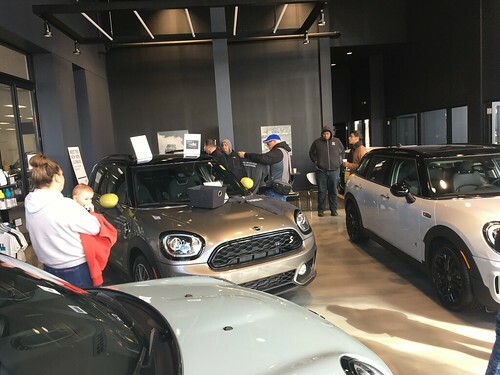 I plan to join Chicago MINI club soon! Come on out to meet us!! Darn, two soccer games that afternoon (big sister) and evening (tommy). Gonna miss it 🙁 Haven’t been there since high school days. Look forward to meeting you Jacob and Emma!!! Just wondering if i can come out and see a event, i just bought a 2007 Mini Cooper S and have some serious questions that the dealer cant even explain. Hey Peter! come on out! it’s open to all comers. I’m sure someone will be able to help you with your questions. Peter, there also seem to be a lot of creative members of the club so even if we can’t answer them, we can make up something really great! Thats awesome. My questions arent that crazy just i bought this car used from a Chevy dealer and the vin and vechile info says its a 2007 Cooper S but the runner door boards have a huge JCW plate and the front rims are Drilled and slotted (not a standard option) i called patrick (where it was originally from) and they say they know nothing of it. but when it left their dealership it had Black Mag 16’s I have Silver 17’s LOL. also. Why in gods name is the Scoop on the engine closed off? that makes no sense to me unless there is concern of water hitting electricals of the engine. also what Cold air system do you guys suggest? or is it a bad idea? My wife and I will be there. Our first CMMC cruise. Looking forward to it. Jim, rock on, welcome, just get the MINI? Yes, we picked it up used last fall. Its a red MCS conv. w/ black bonnet stripes. Can’t wait for top down weather! Hi. We’re new to the area and are thinking about joining. We’d like to meet everyone this Friday. Jim has an ’05 yellow with white top and bonnet stripes Cooper S and I have an all black ’07 Cooper. Johnathan B. – we just moved here from Philly but are both native to Pittsburgh. GO PENGUINS!!!! I used to have dreams, as a kid, that I was the tarzan hot dog! Count me in +1. It’ll be my first time at a mini social with my new guy. I will be there with my nephew – not Marcello who did the Spring Run, I’m bringing his younger brother Asconio. I’m scheduled to have my roof painted in Snow Leopard on April 27th – just in time for the Milwaukee Mile. Woohoo! Hello! I’d like to tag, but I’m not a member. Can I bring forms etc. to the meet? Hey Adam and to all of the other new MINI people! Come on out! Give us a try first. If you like what you see, we’ll gladly accept your application. Is the date gonna be changed because of the weather??? Nope, we will be there rain or shine.. Just hope good MINI karma keeps the bad weather away for a while in the evening. Not sure if I’ll be able to make it – would love to. As my days as a MINI owner are numbered. Ordered a new 135i today. Any other CMMC events between now and the end of May when my car comes in? We are working on a big event for mid-to-late May. Stay tuned! Because he’s home alone while I am at work all day, I can’t really leave him home alone all night too. Have fun though and hopefully I will be able to make it to the next event! P.S. I just got back from England and saw loads of old MINIs – I wonder if I can find one here…! I am bringing my Dachshund with me! After all, she is a Wienerdog and we’re going to Superdawg! Can’t wait for tonight. Clive (my mini) just got back from a service so he is ready to go. So excited to meet everyone. YAY!!! My meetings finished earlier than expected. I will be there! My family and I had a fantastic time tonight!!! Thanks to everyone for making this such a fun event. I know our cruise drew quite a bit of attention from people as we drove by. Great turnout!! hope everyone had a good time! Love that Superdawg!!! Wow, we had an awesome time. Big turnout, great food, the weather held!!! SUPERDAWG really came through w/ the hospitality and parking… VERY nice driving route -all right turns 🙂 It was really great to see everyone, and meet new people. Thanks to all for making this a super event. Pictures soon! Absolutely amazing time guys! Thanks so much! And id like to especially thank everyone for helping me with all those crazy questions about my Mystery car. LOL cant wait for the next one. Great Job! Thanks CMMC great seeing eveyone and meeting new folks too. I recommend A SUPERDAWG RUN every year. I think a superdawg run should happen every month! april-oct??? Agreed! Monthly would be a blast. Sorry it took me so long to get these up but i was slammed this weekend. IF any of you guys want those let me know, and sorry for copying the branding elements, but i thought it would be a nice touch. What about Hot Doug’s on California?